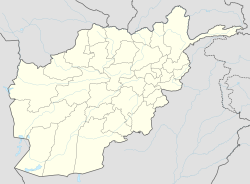 Khōst (Pashto: خوست‎; or Khēst, خېست) is the capital city of Khost Province, Afghanistan. It is the largest city in the southeastern part of the country, and also the largest in the region of Loya Paktia. To the south and east of Khost lie Waziristan and Kurram in Pakistan. Khost is the home of Shaikh Zayed University. Khost Airport serves the city as well as the larger region surrounding the city. Khost is located about 150 kilometres south of Kabul. Khost lies on a plateau of minimally 1,000 metres (3,300 ft) altitude that extends to the East for about 40 kilometres (25 mi) until the Pakistan border. 30 km to the North the peaks start up to 2,500 to 3,000 metres (8,200 to 9,800 ft) right next to the frontier, while 20 kilometres (12 mi) to the South, near the border, the average is around 1,800 m.
Khost has a semi-arid climate (Köppen BSk though very close to qualifying as BSh). Khost is located in the "Khost Bowl", a valley with lower elevation than the surrounding highlands, because of which it is known for its pleasant weather. With a January average of 4.8 °C (40.6 °F), Khost has noticeably milder winters, as compared to the much harsher and snowy winters of the surrounding higher towns to the north, west, and south (listed anticlockwise): Parachinar, Tari Mangal, Aryob, Tsamkani, Khandkhel, Gardez, Zurmat, Sharana, Zerok, Urgun, Angur Ada, Kaniguram, and Razmak. However, frosts are still frequent in Khost during the mornings. Most unusually for Afghanistan, Khost receives a substantial proportion of its annual rainfall of 475 millimetres (19 in) from the South Asian monsoon, because it is open to the southeast (towards the lower elevation Miramshah) from which the moist winds come. Nonetheless, for a large proportion of the year Khost remains hot and dry, and in many years there is no significant rain during the summer. In March 1924, Khost was the scene of a rebellion by the Mangal Pashtun tribe, later joined by the Sulaiman Khel and Ali Khel tribes, known as the Khost rebellion. After causing the death of over 14,000 Afghans, the revolt was finally quelled in January 1925. During the Soviet–Afghan War, Khost was the object of a siege which lasted for more than eight years. Soon after the invasion of Afghanistan by Soviet troops, Afghan guerillas took control of the only land route between Khost and Gardez, effectively putting a stop to the Soviet advance. During the assault on the Zhawar Kili Cave complex, the Soviets used the Khost Airfield as an initial staging ground to insert troops into the combat zone, using Mil Mi-8 armed helicopter transport ships. As of April 1995, Khost was under the control of the Taliban. Khost is a Provincial Center in eastern Afghanistan on the border with Pakistan. The eastern districts (1–3) are characterized by forests and residential land while the western districts (4–5) have more barren land with residential. There are also several waterways accounting for 5% of total land use. Khost has been in American control since the 2001 US led invasion of Afghanistan. Due to its location in eastern Afghanistan, it was a hotbed for insurgent activity attempting to dislodge the American forces there. Like most other provinces, Khost is home to maneuver forces and a Provincial Reconstruction Team (PRT). Maneuver forces wage war against insurgents and assist the Afghan National Army and the Afghan National Police in operations, while the PRT handles the reconstruction aspects. In early 2007, Lieutenant Colonel Scottie Custer of the 82nd Airborne Division saw that the best way to limit insurgent activity in Khost was to forward-deploy some 187 paratroopers under his command to Force Protection Facilities in Khost's various district centers around sub-governors' mansions, to directly protect these, maintain a visible presence in population centers, and help mentor Afghan National Army and Afghan National Police units operating across Khost. The FPFs brought a broader sense of security and prosperity to surrounding areas. Bazaars, shops, and gas stations have improved the quality of life for local residents. The Mandozai Force Protection Facilities in Khost include a medical clinic attached to further assist Afghans in need of basic medical assistance. The offices of Khost's various sub-governors had experienced increased activity as Afghans went there to settle disputes and voice concerns instead of going through traditional tribal channels and bribes, cutting down on sectarian suspicion and strife. Throughout 2007 and 2008 roads had been improved, businesses were springing up and schools were being built, at least 50 in 2007 alone with another 25 planned for 2008. A new airport was under construction as the Khost Airfield was used by the US Military, creating new opportunities and jobs. The Provincial Reconstruction Team, led by CDR David Adams was instrumental in connecting the people to the government in Khost City, by ensuring the PRT was able to execute over $2.5 million under the Commanders Emergency Response Program (CERP) program. On May 12, 2009, several teams of armed militants stormed Khost, prompting a heavy 6-hour battle with US and Afghan National Army forces. Reportedly the attack involved 10 suicide bombers, of whom seven were able to detonate and three were shot by security forces. Coalition Forces, aided by the Afghan National Army and Afghan National Police, took the lead in repelling the attack. On 30 December 2009, a suicide bomber attacked Forward Operating Base Chapman, a major CIA base in Khost, and killed seven CIA officers, including the chief of the base. On 18 February 2011 a suicide car bomber targeted a police checkpoint and killed 11 people. The urban population of the city of Khost is 106,083 (in 2015), mostly Pashtun (mainly from the tribes of Zadran, Mangal, Zazi, Tani, Gurbuz, Muqbal, Sabari, and Wazir), living in 11,787 dwellings, arranged in six municipal districts. On 20 November 2009 a bomb killed 3 civilians and wounded 3 others as a car hit a roadside bomb in Khost City. According to the chief of criminal investigation the act was perpetrated by the Taliban. On 24 November 2009, according to the Afghan Ministry of Interior, 6 people, including 5 children were killed when a remote control bomb attacked a water station in Khost which had been built by the Rural Rehabilitation Ministry to distribute water to the locals. On 14 July 2011, according to a spokesman for the provincial government, NATO ground troops killed six civilians in a night raid of the village of Toora Worai, in an area known as Matoon, about seven kilometres from the Khost provincial capital of Khost city. Cricket is growing in popularity in Khost, with the sport being introduced by newly returned refugees from Pakistan. Afghanistan spinner Mujeeb Ur Rahman, and batsman Noor Ali, as well as Nawroz Mangal, the former captain of Afghanistan Cricket Team hail from Khost. Dawlat Zadran, the Afghan Cricket paceman who grabbed two crucial wickets against Pakistan (in 1st International One Day against Full Member), is also from Khost. In football, Khost and the surrounding region is represented by De Abasin Sape F.C. in the Afghan Premier League. Khost Cricket Stadium, constructed with financial support from Germany. The inauguration of the stadium also included an exhibitory match which witnessed a record crowd for any sport played in Afghanistan. Khost City Ground, a multi-purpose stadium in Khost for football and other sports. ^ "Khost Climate Normals 1961-1990". National Oceanic and Atmospheric Administration. Retrieved December 26, 2012. ^ "C Khost, Afghanistan". allmetsat. Retrieved 1 November 2011. ^ WikiLeaks, "Six Month Assessment July 2007"
^ Gorham, Siobham (December 31, 2009). "Suicide Bombing in Afghanistan Devastates Critical Hub for CIA Activities". Wall Street Journal. Retrieved January 1, 2010. ^ "AP sources: Suicide bomber invited on base". Associated Press. December 31, 2009. ^ "Afghanistan suicide bombing kills 8 CIA officers". Los Angeles Times. 2009-12-31. Retrieved 2010-03-28. ^ "Afghan suicide car bomber kills 11 in Khost city". bbc.co.uk. 2009-12-31. Retrieved 2011-02-18. 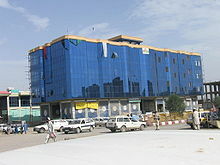 Wikimedia Commons has media related to Khost City. Khost Municipality on YouTube, February 11, 2018, Independent Directorate of local Governance (IDLG).